The time has come to underscore once more that the outcome of the presidential election on January 8 will not be determined by members of parliament regardless whether they cross over or stay put but by the masses of this country who will assume their oft neglected role as the true kingmakers of this nation. If they fail to realise the gravity of the responsibility thrust upon them, then they will have only themselves to blame; and will receive the leader they deserve to get. Crossovers by MPs will bring neither victory nor defeat to either the Government or the opposition. This is not an impeachment bill that the opposition has presented in Parliament where the fate of the incumbent executive president solely lies in the hands of the MPs and whose stance becomes of paramount importance. Had it been an impeachment crisis the President faced, the number of MPs leaving government ranks to vote to remove the President from office would have been of the utmost importance and concern and the nation would have been justified in being agog at the fall of wickets and for awaiting with mounting anticipation for a debacle to ensue. But it is not. Nay, this is a presidential election, as far removed from the scope of parliamentary members to influence the course of events as mankind is to tilt the balance of the earth. This time round, the moment belongs to the people. It is their collective vote that will decide who will adorn the purple sash of power, not the individual crossings of an MP or any other second league politician. That is not to say that crossovers do not count. Most definitely they do. But their bearing on the ebb and tide of public opinion will depend not on numbers alone but on the calibre of the people who change sides and nail their colours to the new mast. Two factors will undoubtedly influence the voters. The value of an individual MP’s crossover to either side of the political divide will depend on the popular support the MP commands in his electorate and the respect he has earned nationwide during the course of time spent either in office or out. The voice of those who have served the people will be heeded. The din of those who have only served themselves from the public larder will be met with a stony silence not to be misinterpreted as agreement. As Shakespeare’s King Lear said, ‘Even a dog’s obeyed in office’ and it would do well for MPs and Ministers, now out of office or facing the prospect of being out soon, to realise that their present exhortations to vote for the candidate they recommend would not be meekly followed, would not be treated as a fiat to be instantly obeyed. The people are not the fools the politicians take them to be. But while the decision to change the political shirt is certainly momentous to the politicos, having as it does a direct effect on their personal fate and fortunes, such chameleon acts, apart from the amusement and entertainment it offers to fill the otherwise dull, drab day, are hardly of much consequences to the man on the street more wrapped up in finding answers how to keep the wolf from his door. But to the pompous political brigade fed on a surfeit of their own imagined importance, their personal shifts of allegiance are earth shattering moments which have a great import upon the land, as if Lanka’s hopes and fears hang breathless upon their vainglorious predilections. This week’s three high profile crossovers were also accompanied with the usual quota of avowals to conscience. First came the crossover of Tissa Attanayake from the UNP to the UPFA camp on Monday. 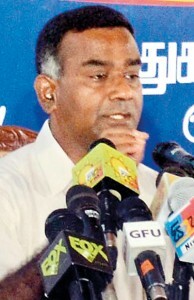 As a national list MP appointed by Ranil Wickremesinghe, and thus without a current voter base, his position in Parliament is not different to that of Malini Fonseka, the UPFA national list MP appointed by President Mahinda Rajapaksa; and, like Malini Fonseka, his contribution to parliamentary debate has not been outstanding. His only credential to be a leading member of the UNP which he deserted at a time when the party ship was showing signs of being salvaged after Ranil outsourced the job, was his position as the secretary of the party, an appointment also made by Ranil Wickremesinghe. media conference held at Jana Kala Kendraya, Battaramulla that he had decided against backing presidential candidate Maithripala Sirisena because the latter had failed to fulfil his main pledge to the UNP Working Committee. The pledge was his promise to engineer the defection of 25 government MPs. The UNP’s support for Sirisena had been made conditional to bringing 25 UPFA MPs. And Maithripala Sirisena had failed to fulfil this condition. In answer to that, Mr. Attanayake’s reaction was to crossover to the camp from where the 25 MPs were to come and strengthen it by one more: himself. After being appointed as SLFP’s Colombo Central Organiser Hirunika Premachandra on January 20 vowed no one could separate her from President Mahinda Rajapaksa as she was his adopted daughter. Speaking at an SLFP Bala Mandala meeting at her residence in Kolonnawa, she declared she was the adopted daughter in the Rajapaksa family. “I am the adopted daughter of President Rajapaksa’s family and the sister of MP Namal Rajapaksa and no-one can separate me from them,” she told the newspapers. But it seems even adopted filial feelings do not come into play when matters of conscience are involved in determining which party colours to boast; and, on the grounds that her conscience no longer allowed her to remain supporting a government that had failed to bring the killers of her father to justice, she left, in search perhaps of a new father figure to adopt. Should Maithripala Sirisena win the election on January 8, he may not only sip the cup of victory to his delight but also find another bundle of dubious joy to his consternation. The man from Polonnaruwa may discover to his chagrin, he has an adopted daughter tucked up somewhere in Kolonnawa. 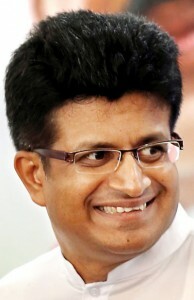 Then on Thursday came news of another surprise crossover for the second time of a member of the second league provincial councils, the ever humble Udaya Gammanpila who had been playing second fiddle to the JHU as Secretary Champika Ranawaka’s deputy. Like one of the four colourful macaw birds that had escaped from President’s House just after the jathika new year in April this year which had finally been captured a few days later and returned once more to its presidential cage, Udaya Gammanpila who had flown along with his Jathika Urumaya flock from Temple Trees only a few days before, returned to roost on the presidential perch once more. Once it was that crossovers took place only on a matter of high principle; and that too, only after genuine soul searching had been done by those brought to the brink to perforce exercise that last resort option. But these battles had generally been done in the private alcoves of their own hearts. It is glad to be told that these battles of conscience over matter of principles are still waged except that the scene has shifted. Grappling with consciences are now conducted in public saloons open all hours over a cup of coffee and crumpet, with the doors swinging to and fro to provide easy entry and exist and reentry. In the circumstances, shouldn’t we raise our hands and thank the lord above that, even in this day and age when graft is rife and corruption common, there walks upon the face of Lanka, a rare pedigreed breed of honourable gentlemen and gentlewomen of moral rectitude who beat their breasts and swear to kingdom come that they too are guided by the same profound morals that spurred their forefathers; and that their long deliberated decision to change horses in mid stream, is only guided by the purest of motives cherished in the cleanest of consciences?